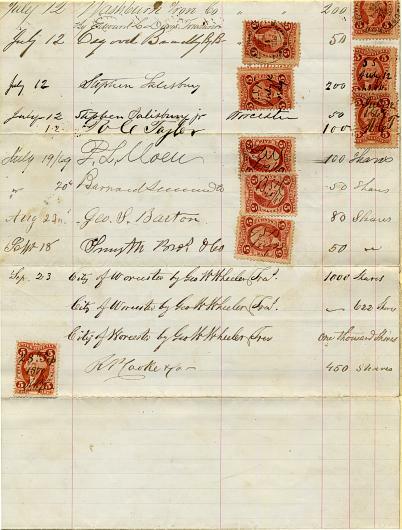 Original RARE Stock Subscription from the Boston, Barre and Gardner Railroad Company issued in 1869. This item is over 139 years old and is hand signed by some of the original stock subscribers. There are also IRS Tax Stamps affixed to the document next to each name. 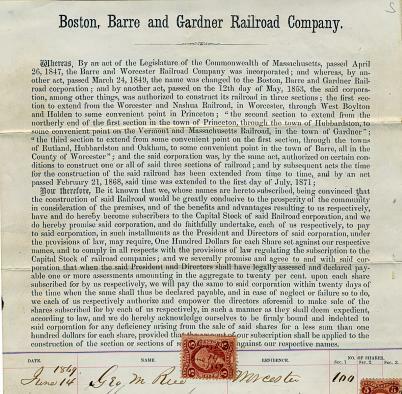 The Barre and Worcester Railroad was chartered in 1847 and reorganized in 1857 as the Boston, Barre and Gardner Railroad. It opened in 1871 between the Worcester and Nashua Railroad at Barber (from which it ran to Worcester via trackage rights) and the V&M in Gardner. An extension in 1874 took it to the Cheshire Railroad at Winchendon. The BB&G leased the Monadnock Railroad in 1874, but reassigned the lease to the Cheshire in 1880. The Boston, Barre and Gardner Railroad Company was merged into the Fitchburg in 1885.